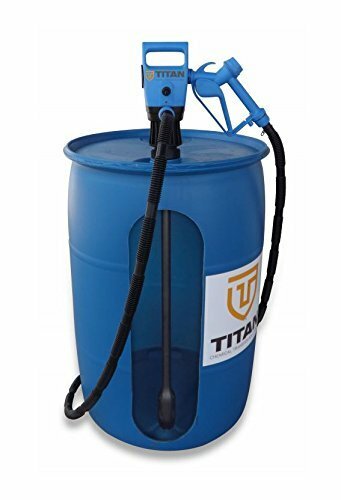 902-031-0 Titan Electric Drum Pump. The TED1 for DEF is an affordable solution for low volume shops and a better alternative to a manual hand pump when pumping from drums. Cross functional with either 115 volt or 12 volt power sources, includes 6'6" plastic DEF hose, manual DEF nozzle, power indicator light and 12 volt alligator clips. It features a self priming submersible pump and is ISO 22241 compliant. Integrated nozzle holder with built in nozzle swivels for ergonomic use. Improved grip of drum bung adapter, adjustable length, down spout is 33.5 inches to 34 inches and fits a standard 55 gallon drum. Filter equipped intake end protects the pump from debris. Includes replaceable particulate filter to 1 micron. Also compatible for use with antifreeze and windshield washer fluid.